Rackliff Island is located in the town of St George near the Village of Spruce Head Island. This island is accessible via a car-driven causeway. Private, yet close to Rockland, Thomaston and Camden, Rackliff Island is a popular vacation destination. Owner Boats Included? : No. This property does not allow boating. Water Supply Disclosure - 3/14/18: Guests renting this cottage should be aware of water conservation as the property is on an island. The cottage is fed water by a drilled well and has a 300 gallon holding tank to back-up the well. Unlike when using a city water supply, guests are encouraged to be mindful of their water consumption as to avoid any lapses in water supply. Side note: Rackliff Island had nearly 70 inches of snowfall and rain during the 2017-2018 winter. I believe this is the third time we have rented with On the Water in Maine. They are well organized,friendly agency to work with. We look forward to renting from them in the near future. Rackliff Island was beautiful and quiet with a great view of the cove and ocean. The house was easy to find and had everything needed. The view of the ocean from the second floor was awesome. You could watch the lobstermen retrieve there lobsters and watch the fog roll in from the ocean. We even saw turkeys and deer on Norton Island. Very relaxing location - not always easy to choose between watching the water from upper deck of the house or porch of the cabin. These pros take care of everything for you. House is always clean and any problem quickly resolved. They have beautiful properties and do all the work in insuring you have a great vacation. Location, location, location. What a beautiful spot. Easy to work with, and efficient operation. It's a quiet lovely setting, with access to a rocky granite shore, nice view over the sea to the east and south, and protected from the wind by tall evergreens, mostly spruces. Access to the site on Rackliff Island is via a causeway and private roads. It's a relatively new structure with a modern kitchen, bedroom, and bath on the lower level, also a deck with grill and table with umbrella. The upper level also has a bed, and a comfortable couch with cable TV, and large windows with excellent sea views. A separate bungalow with a double bed and a single bunk is adjacent to the main house, ideal for children or young adults; however there is no bathroom in that structure. As we are an older retired couple, we did not have a use for that part of the arrangement. We loved Halcyon Point. The house and the cottage are beautiful and well appointed. The kitchen base everything needed for those who love to cook. The views are fantastic and sitting on the rocks at the end of the path was gorgeous. On the Water in Maine was professional, straightforward, and helpful. You can't ask for moire than that. Halcyon Point is genuinely delightful. The location is ideal, simultaneously relaxing and inviting. The house is well suited for an average sized family--the stockpile of board games on offer gives people a welcomed excuse to put away their phones and enjoy spending time with one another. Simply put, the place is terrific. Very efficient, information was clear and concise. The view and setting are superb, just the spot for a Downeast experience. Outstanding location - oceanfront, sounds and smells delicious Wonderful property - comfortable, great views and relaxation on upper deck or from inside the upper room with the sliding door closed Convenient to terrific dining in Rockland, Rockport...even Camden. Not to mention McLoons!!! Everyone from OTWM was personable and knowledgeable. It felt like I was talking to and old friend every time I called. When I had an issue, the return call was made within 3 minutes. Problem promptly solved. All businesses should be as efficient and pleasant to deal with. The view. It was all about the view. We arrived with things to do and great aspirations of getting them done. We got nothing done. No complaints. We just couldn't stop soaking up the view. Peaceful, tranquil and always beautiful. We never got tired of the view. We ate at home every night so we wouldn't be away from the view and comforts of home. Wonderful experience. Can't wait to come again. THIS WAS OUR 6TH YEAR RENTING THROUGH OTWIM. THE COMPANY HAS MOVED FROM VERY GOOD TO EXCELLENT. THERE IS A FEELING OF EQUAL RESPONSIBILITY EXPECTED FROM OWNER AND RENTER ALIKE. CONTACT WITH THE COMPANY IS QUICK AND CALLS ARE RELIABLY RETURNED. OUR 3RD YEAR IN THIS PROPERTY SEEMED FAMILIAR AND WELCOMING. WE ENJOYED A SUPERLATIVE DINNER AT THE LOST KITCHEN IN FREEDOM, AN EXPERIENCE THAT ANYONE WHO LOVES FOOD SHOULD TRY TO HAVE. AND OUR SECOND BEST MEAL WAS THE ANCHOR IN ROUND POND RECOMMENDED BY JUSTIN. IT LOOKS LIKE TYPICAL MAINE SEAFOOD ON PAPER BUT IT IS TRULY GOURMET. OTWIM is a model service organization. Halcyon Point is a modern art work house, scandinavian in its clean geometry and sparse serenity. The siting and orientation of the modern house has been planned to catch the spectacular view of Norton Island just s short gull fly from the rocks below Halcyon Point, and the open ocean to the southeast. The fog comes in quietly at times, and then is gone as quickly. The layout o the rooms is unconventional, but chosen to keep the footprint small. We did not use the Guest House, but that looked equally as appealing. Justin, the Owner of On the Water in Maine, is amazing in his knowledge of rental properties and his memory of renter names. It is very relaxing to have a telephone # dedicated to quick response of questions and problems. The office staff fielding calls are wonderfully friendly and personal. The overwheming feature of Halcyon Point is its site and view. It is all in the name...tranquil. There is great privacy from the one neighboring property with residents. The master bedroom is large and comfortable, the kitchen very well supplied to produce and enjoy full meals on site. And always a distracting view while cooking! The lazy upstairs den is like a cozy treehouse for relaxing in the morning with coffee and maple scone from The Market Basket until the day's plans pull together and again in the evening to watch some news or a movie. This was a very enjoyable rental in which to spend two weeks on Maine's coast. The overwhelming asset is the view from all parts of the house. The house itself is very simple with the only comfortable relaxing space on the second level. The one bedroom is large with a comfortable king bed. The kitchen is well-equipped for cooking meals. The downside is the one small bathroom. An upgrade to a larger TV would be welcome. Rockland is 15-20 min. by car, the closest place for adequate shopping. A really enchanting spot to which we would return. On the Water... is the best agency I have EVER worked with. Great water views. Very comfortable cottage. The agency was very efficient and all went smoothly . When we expressed concern about some disturbance from the building work which started on the Monday of our stay after a peaceful weekend, the agency did their best to investigate (the building work had apparently unexpectedly over-run due to the late spring). We were offered an alternative very nice property for the last couple of days of our stay but did not take up the offer due to the little time left and the fact that the noise from the building work had reduced to a more tolerable level as the week went on. The house exceeded our expectations with wonderful views including bald eagles and ospreys fishing. This was the best equipped house we've ever stayed in with an amazing range of books and board games, as well as everything you could possibly need in the kitchen. A very comfortable house in a beautiful setting. Beautiful property. We had a wonderful time, even though it rained most of the week, we had a lovely time. We were especially thankful for all the games, which we made use of nightly!! We will definitely be returning! It was very helpful that the outside lights were on when we arrived Saturday evening. Thank you, Justin, for coming to Halcyon to deal with minor repairs. You and the rest of your staff at On the Water in Maine are always very pleasant to work with. Halcyon Point Cottage is a blissful site. We very much enjoyed the home and the setting. Neighbors, human and animal, were engaging. Thank you for sharing. 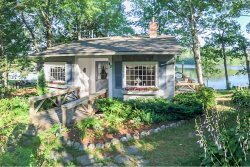 Thank you On the Water in Maine for all of your attention both with this house and the Bar Island Cottage we rented from you before it. Both are lovely.